(Bloomberg) -- U.S. crude output is accelerating, highlighting OPEC’s dilemma as the cartel reins in its own production to revive prices. Soaring output is putting the U.S. on course to become a net exporter of crude oil and petroleum products next year. 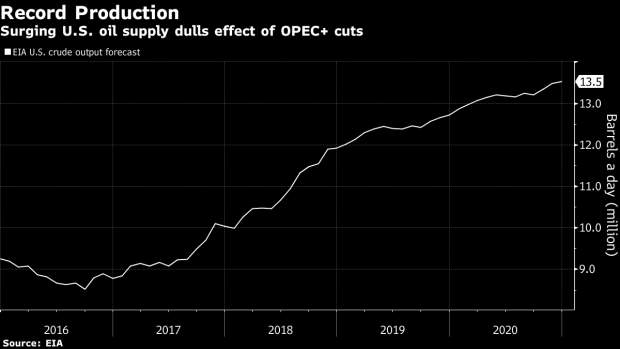 It’s also forcing OPEC to scale back estimates of how much crude the group needs to pump this year as the demand outlook softens. The EIA reduced its forecasts for both Brent and West Texas Intermediate oil benchmarks by $3 a barrel for 2020. “Despite many uncertainties, EIA believes strong growth in global oil production will put downward pressure on prices,” Capuano said.